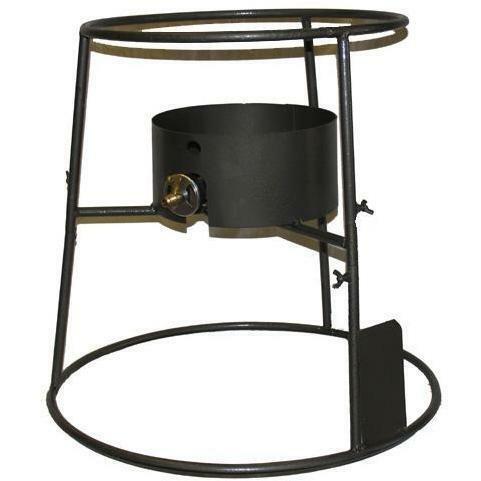 Product Description: Cajun Cookware 10-Gallon Jambalaya Pot Stand With Propane Gas Burner - GL10443A-10 GL611. This Cajun Cookware stand is perfect for jambalaya pots and also holds the gas burner. This Cajun Cookware jambalaya pot stand eliminates the need for a separate burner stand, and the issue of bottom clearance for the burner itself! Burner is included, 60,000 BTUs, For use with LP Fuel only. The Cajun Cookware stand measures 20. 5 inches tall, approximately 19 inches at the Inner diameter on the top, and the base is about 24 inches in diameter. This Cajun Cookware jambalaya stand fits our 10 gallon Jambalaya pot.